While one of the hardest sports available, gymnastics doesn’t require of you to spend a fortune. 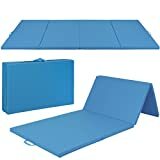 But even if you are starting with your training, teach locally or have just enrolled your kid, a gymnastic mat for home is essential. The list below is a carefully selected collection from Amazon best sellers. We took many reviews in consideration, and doing so singled out the best from the best of products. What you are looking at is a palate of affordable, yet premium quality gymnastic mats for home. 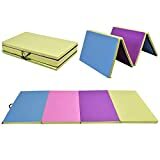 Once you click each link, you’ll be redirected to Amazon, where you can chose thickness and size, and additionally pick a color option as well. 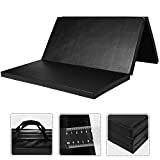 Most of these come with free shipping included, and reading the reviews will reassure you of our carefully selected choice. Gymnastic mats for home – what do you need to look for? 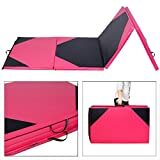 The great thing about gymnastics is that progression happens gradually, which means that it can be a while before you need to supplement the gymnastic mat, and purchase your next item. 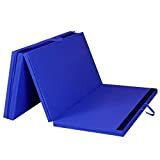 Regardless of whether you are looking for a tumbling mat or a cheese mat, the first thing you have to consider is space. Measurements are very important, so take your tape and write down the restrictions. Tumbl Trak, Soozier, We Sell Mats, Z-Athletic and WolfWise all sell their products in numerous size options. So make sure to measure in inches, or convert your measurements, and select the most appropriate variety. As far as thickness goes, you’d want to start with the standard option, and that is 1 3/8” (inches). Gymnastic mats that are thinner than this won’t provide the adequate protection and cushioning from the unforgiving floor. 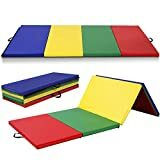 As for different types of gymnastic mats for home, you have the paneled mat, the cartwheel mat, the flexi-roll mat and the incline mat (otherwise known as cheese mat for gymnastics). 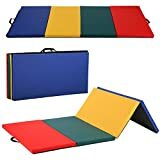 Each of these serves a different purpose, but the paneled mat would be an excellent option for kids who are just starting out. 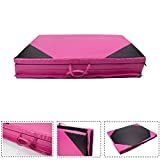 The reason for this is mainly because these come in larger sizes when compared with others with a similar price tag, and you can also fold them for storage (hence folded mats). 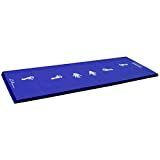 The cartwheel mat is excellent for kids who are beginners, for it includes drawings of hand and feet positioning, for easy and guided practice. 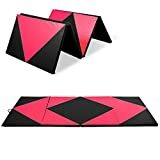 These are not foldable, and most often outgrown in weeks, so you better skip buying one, and get yourself a folding tumbling mat. 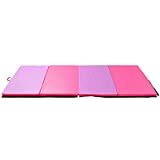 Kids can also benefit from an inclined mat (cheese mat for gymnastics), since it will allow them to practice forward and backward rolls with ease granting better body awareness. The flexi-roll mats are generally made to look and feel like a genuine competition floor. 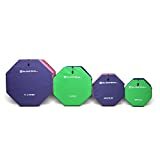 These can be rolled for easy storage, and are great for preparing kids – it tells them how a competition floor would feel. Even the cheap gymnastic tumbling mats for home will last for several years at least, despite of hard daily wear. 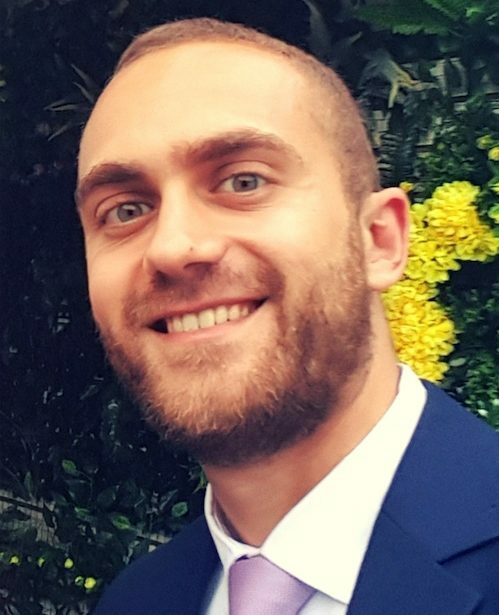 What is great about this investment is that it can easily be used for other sports and activities as well, including wrestling, cheerleading and dancing. Several practices of martial arts would benefit from a quality tumbling mat as well. 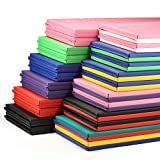 If you are a fitness enthusiast, a simple gymnastic mat will go a long way in improving your comfort with stretching exercises as well. Kids will be kids, so you’d have to talk to them first. Explain what types of shoes are ok, and never allow outdoor shoes to be used. Let your kids learn to appreciate their mat, and approach it with care and routine-like preparation. No shoes is probably the best option, and as your kid progresses, you can buy tape and dedicated gymnastic shoes for optimal protection. We find that most gymnastic mats are damaged during birthday parties, or when friends of your kids come and visit. But if you teach your kid to take care of the gymnastic mat, he or she will know how to place certain boundaries when friends are around. 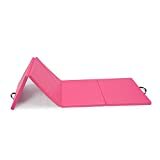 Other than that, the best option is to fold the gymnastic mat when there are more kids around, or supervise at least for a while, setting up some ground rules. Storage is also crucial, so you won’t want to keep the tumbling mat in a room temperature below 10 degrees Celsius. Additionally, make sure to use a wet cloth and wipe the surface every now and then. Repair kits are sold separately, and you might want to use one if there is a small and insignificant crack on the surface material, but anything more than that, you won’t want to risk safety. Another thing you have to do, at least once per week, is thorough disinfecting. Hands, feet, sweat… a lot of bacteria can pile up, so in order to keep your kid healthy you’d have to disinfect once in a while. This depends on frequency of use, but once per week is usually a good rule of thumb. You can use a cleaning solution, or mix bleach and water at about 10 to 1 ratio (more water). 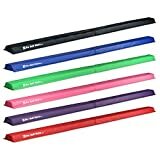 Your kid will definitely benefit from a gymnastic mat for home, and it can provide extra inspiration to try new moves and practice regularly. Intentional and disciplined practice is very important, and investing money in buying a good tumbling mat might pay huge dividends down the road. Even if your kid is a seasonal enthusiast, and drops the habit very quickly, the investment pays off nonetheless, considering the safety issue. 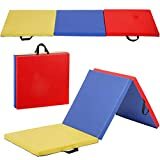 Nothing is worth risking an injury or worse, so make sure to tape the right measurements, select the appropriate color and thickens, and scroll back to look again at the selection of cheap gymnastic mats for sale. Here is to some dedicated, disciplined, and safe practice. Have fun!